Iron is an essential nutrient that helps carry oxygen in our blood and ensure our immune system is functioning at full capacity to keep us fit and healthy. 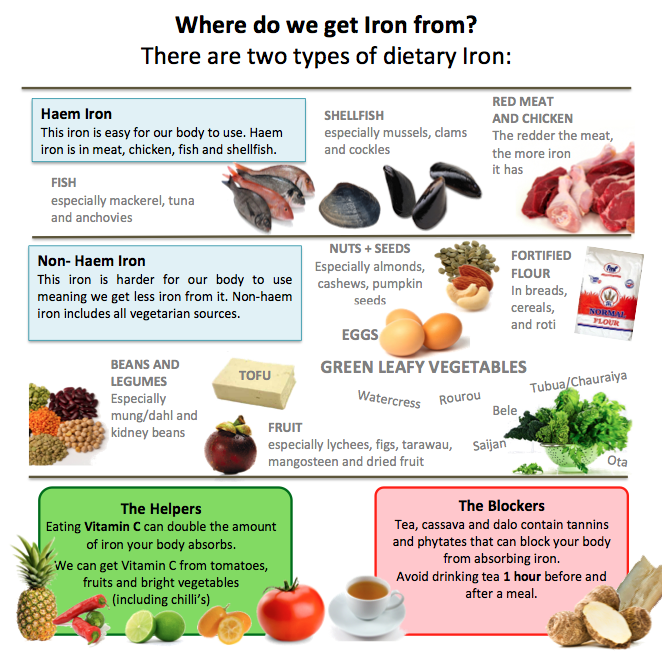 If we don’t get enough iron in our diet we are at risk of the blood condition called Anaemia. Anaemia means that you have fewer red blood cells than normal, or less haemoglobin in those red blood cells than normal. All of our organs (like our heart, kidneys and muscles) need oxygen and these red blood cells and haemoglobin normally carry that oxygen around the body to keep us fuelled and energised. If you or your children are anaemic they may come across as tired, weak, lethargic or irritable; become dizzy frequently and be short of breath. They can also present with pale coloured palms, eyelids and gums as well as hair loss. Prevalence in Fiji: 50% of children under 5 have iron deficiency anaemia, and 25% of children between 5-11 years! Around 40% of women are also anaemic due to iron deficiency. These are big numbers, especially considering so many foods in Fiji are naturally rich in iron. Why is Anaemia a health risk? As well as leaving them feeling tired and unmotivated all the time, it is important to treat Anaemia as it can impair the child’s physical and mental health and increase their risk of illness and infection. Studies have found that children who suffer from deficiencies in the first two years of life suffer irreversible damage leading to shorter adult height, lower attained schooling, reduced intelligence, income and productivity. That’s a lot of negatives that could be avoided if we ensure our children are getting the right amount of iron from a healthy and balanced diet. In Fiji children under the age of 5 can receive iron from the NIMs supplementation program, which distributes iron and vitamin rich powder from health centres to sprinkle on top of food. Flour in Fiji is also now high in iron. Although these options can help boost you and your child’s iron to avoid deficiency, a diet full of fresh, local foods is the best way to ensure you get enough iron (and all other vitamins) every day. The best natural source of Iron is meat because our body can absorb it easily. But vegetables, lentils and legumes also contain iron. We just need to mix them with a bit of chilli, cumquat or tomato as these provide vitamin C that opens the gates for iron to be absorbed in our body. Luckily, these ingredients also have lots of flavour so they make a great addition to your iron-rich meals. You can grow iron rich foods such as dark leafy greens (Bele, watercress/Karamuo, Tubua/Chauraiya, Rourou, Saijan) and pumpkin seeds. You can also grow Vitamin C rich vegetables and fruits to team with your iron sources such as tomatoes, chilli’s, capsicum, cumquats, limes, oranges and pineapples. Dalo, Cassava and Tea can block iron absorption. Try not to eat these foods in the same meal as iron rich foods.